MOUNT PLEASANT (Wisconsin) – The owner of a southern Wisconsin house might not be in love with the Oscar Mayer wiener right now. 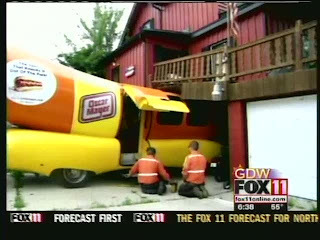 The Oscar Mayer Wienermobile crashed into a Mount Pleasant house around noon Friday. Mount Pleasant Police Chief Tim Zarzecki (zahr-ZEK-ee) says the 22-year-old female driver was turning the giant hot dog on wheels around in a driveway and thought she was reversing but instead went forward and crashed into the deck and garage. No one was home and no one was injured. Oscar Mayer spokeswoman Sydney Lindner apologized for any inconvenience to the home owner. Lindner says the company will work with insurance companies to fix the damage to the house and vehicle. This happens just days after PETA asks Oscar Mayer to “bury the Wienermobile.” ( Story ) I see this as a sign that PETA might have been right on this one. This entry was posted in cars, dangerous foods, peta on July 18, 2009 by saro.